U.S. Army photo by Pfc. Nyatan BolU.S. 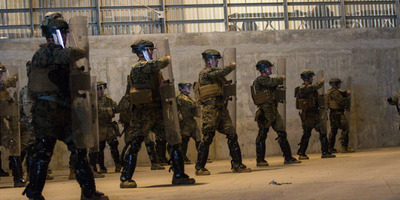 Soldiers and Marines assigned to Special Purpose Marine Air-Ground Task Force 7, practice non-lethal crowd control drills at the Calexico West Port of Entry in Calexico, California on Nov. 27, 2018. 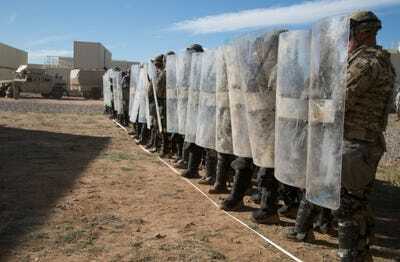 Customs and Border Protection announced Tuesday that over the next few weeks, border agents and troops deployed to the southern border will be conducting tactical readiness training in preparation for potential violence. The White House recently sent a memo to the Department of Defence authorizing deployed troops to use force to protect CBP personnel. The apparent shift from running razor wire to bracing for possible confrontations comes as thousands of migrants arrive at the border. Active-duty troops deployed to the US-Mexico border are increasingly bracing for confrontations rather than just running razor wire to deter their entry in the US, images published by the US military show. Over the past week, US troops have been conducting non-lethal riot control training at bases in Arizona and California, and tactical training is expected to continue. 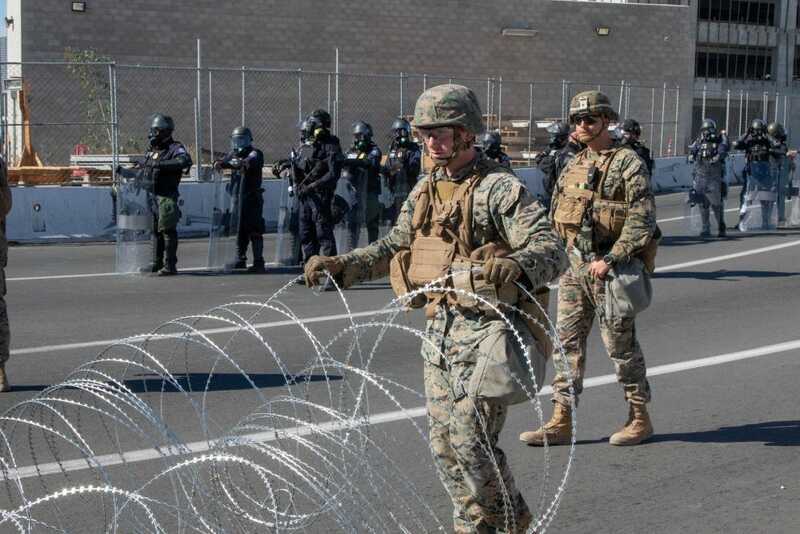 Soldiers and Marines were also apparently present on Sunday at San Ysidro, a busy port of entry where border agents clashed with migrants, using tear gas against those who rushed the border. 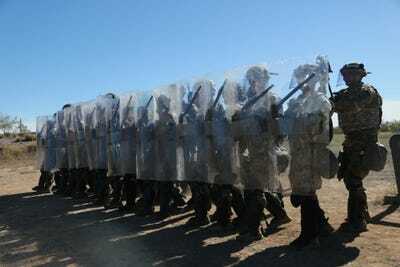 This is how US troops are training for confrontations at the border. For weeks, the emphasis was on hardening crossings and ports of entry, but now there appears to be an increased focus on force protection. U.S. Army Photo by Pfc. 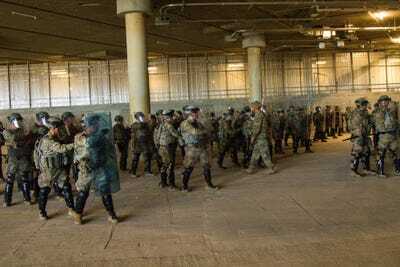 Bradley McKinleySoldiers from 65th Military Police Company, 503rd Airborne Military Police Battalion, finish non lethal training in Davis-Monthan Air Force Base, Arizona, November 26, 2018. Active-duty military personnel with riot shields were present at the San Ysidro port of entry Sunday, when CBP agents used tear gas and tactics to drive back migrants who rushed the border, some of whom threw rocks at US agents. Some critics have called the CBP response an overreaction. U.S. Army photo by Staff Sgt. 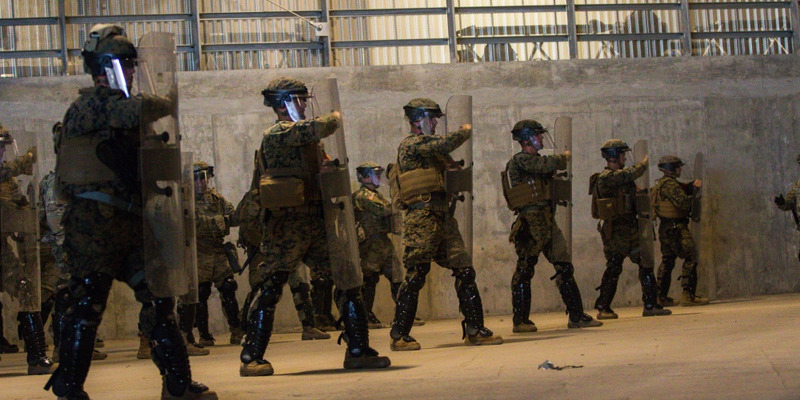 Jesse UntalanMarines attached to Special Purpose Marine Air-Ground Task Force 7 join Customs and Border Protection at San Ysidro Point of Entry, California, Nov. 25, 2018. 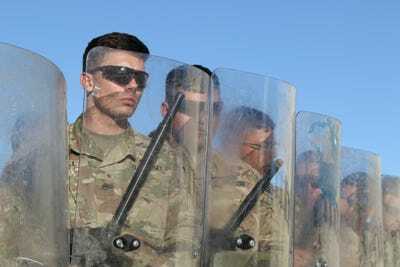 US troops are authorised to provide force protection for border agents, but are barred by law from law enforcement in the US. 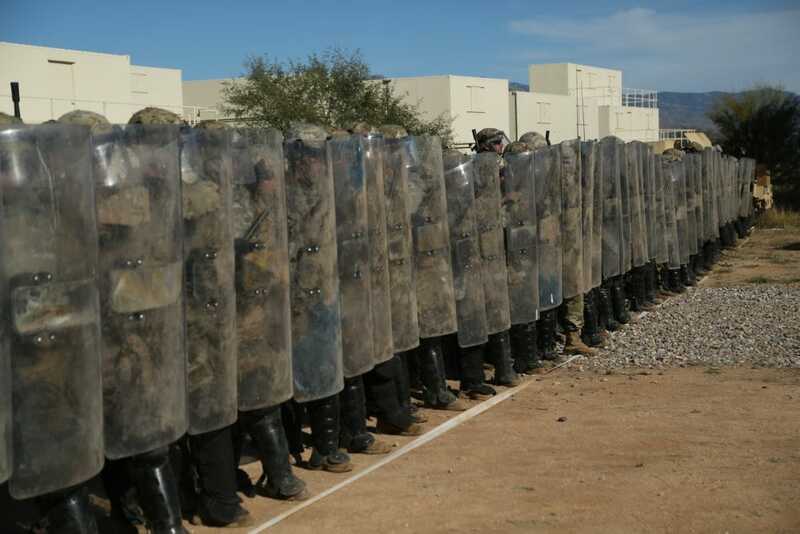 While some training is taking place in California, just opposite where thousands of migrants have set up camp, much of the tactical training appears to be occurring in Arizona. U.S. Army Photo by Pfc. 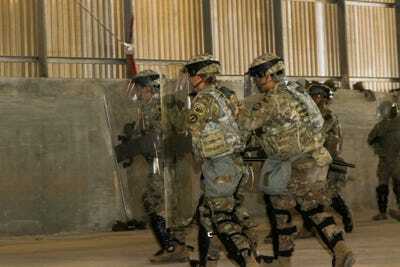 Bradley McKinleySoldiers from 65th Military Police Company, 503rd Airborne Military Police Battalion, take cover to conduct non lethal training in Davis-Monthan Air Force Base, Arizona, November 26, 2018. 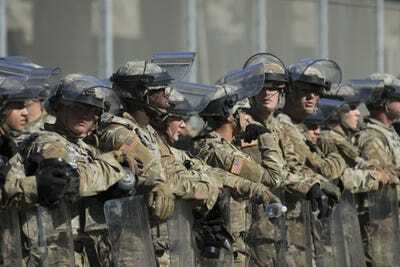 300 active-duty troops previously stationed in Texas and Arizona were shifted to California. U.S. Army Photo by Pfc. 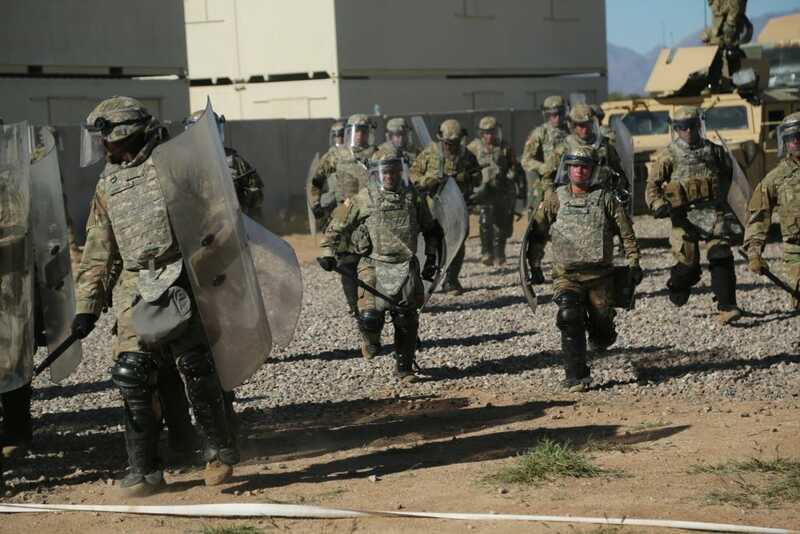 Bradley McKinleySoldiers from the 65th Military Police Company, 503rd Airborne Military Police Battalion, conduct non-lethal riot control training in Davis-Monthan Air Force Base. CBP spokeswoman Teresa Small told the Associated Press that another large caravan appears to be headed for Arizona. U.S. Army photo by Spc. 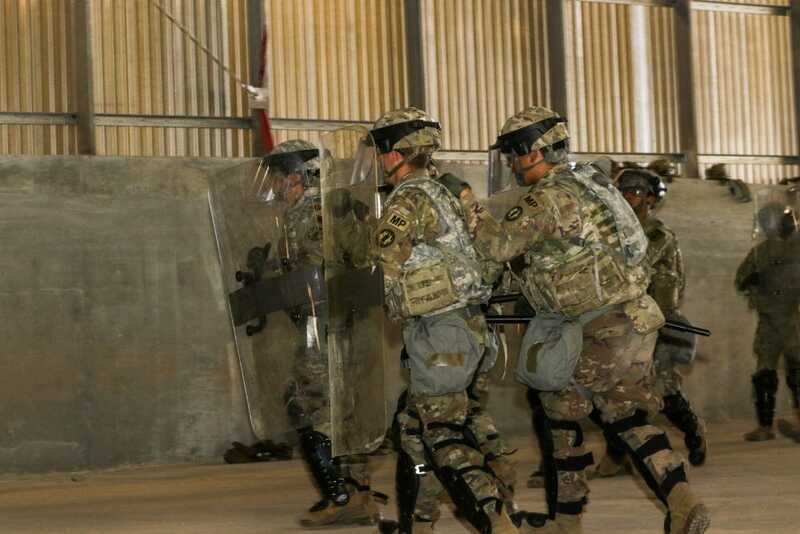 Hosannah VickerySoldiers from the 65th Military Police Company, 503rd Airborne Military Police Battalion, conduct non-lethal riot control training. “Over the next couple of weeks, teams of CBP officers, agents, and DoD personnel will be conducting tactical exercises that could potentially cause temporary delays to cross-border traffic,” CBP said in a statement Wednesday. U.S. Army photo by Pfc. Nyatan BolSoldiers and Marines practice non-lethal crowd control drills at the Calexico West Port of Entry in Calexico, California on Nov. 27, 2018. U.S. Army photo by Spc. Hosannah VickerySoldiers conduct non-lethal riot control training at Davis-Monthan Air Force Base, Arizona, November 26, 2018. 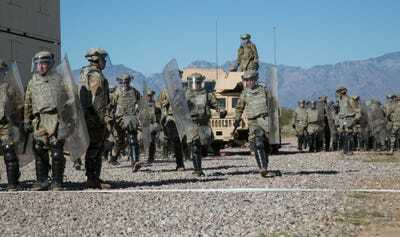 Nearly 6,000 active-duty troops were initially deployed to the border as part of Operation Faithful Patriot, a name that has been discarded and replaced with “border support.” The number has decreased, but there are still 5,600 active-duty troops at the southern border, on top of the more than 2,000 National Guard troops that were deployed there earlier this year. U.S. Army photo by Pfc. 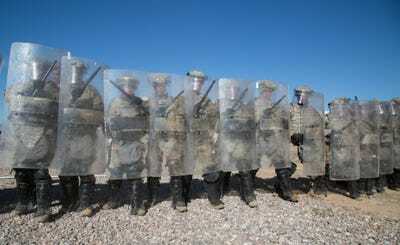 Nyatan BolTroops assigned to Special Purpose Marine Air-Ground Task Force 7, practice non-lethal crowd control drills at the Calexico West Port of Entry in Calexico, California on Nov. 27, 2018. Limited to a support role, troops ran razor wire and erected barriers. Last week, the White House sent the Department of Defence a memo authorizing troops to use force to protect CBP agents, including lethal force, if necessary. Secretary of Defence Jim Mattis has insisted that there has been no call for lethal force, adding that troops are not armed. CBP has made it clear, though, that safety and security are a priority. U.S. Army photo by Sgt. Kyle LarsenSoldiers from the 65th MP (Military Police) Company Airborne, 503rd MP Battalion Airborne, perform Military Operations on Urbanized Terrain (MOUT) at Davis-Monthan Air Force Base, Ariz., Nov. 25, 2018. While some troops have been bracing for conflict, others are still running concertina wire. 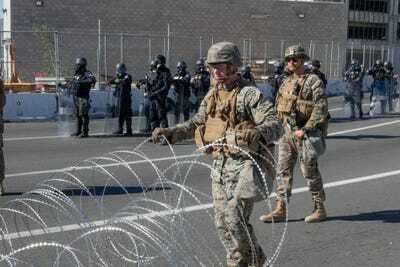 The US military has already run several miles of razor wire along the southern border. U.S. Army photo by Spc. Ethan ValetskiA Marine with the 7th Engineer Support Battalion, Special Purpose Marine Air-Ground Task Force 7, moves concertina wire into place at the San Ysidro Port of Entry, California, Nov. 25, 2018.